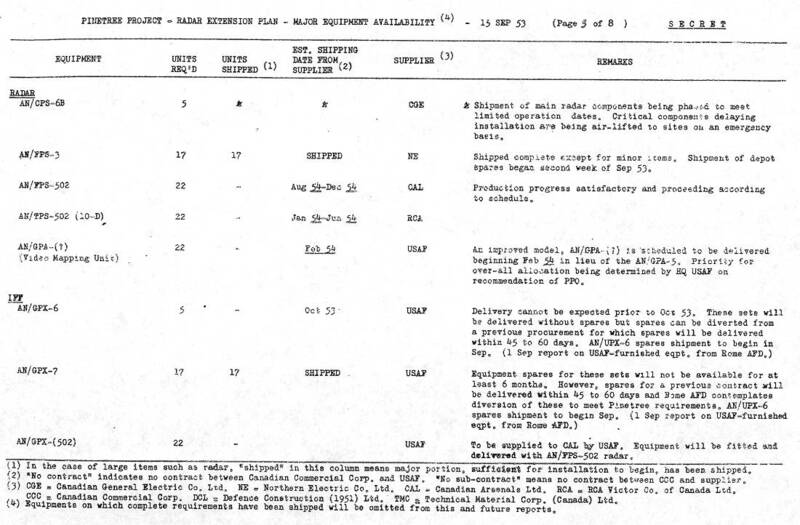 This table originally detailed equipment deliveries in the Progress Report as a guide for installation planning but shipments have reached such a stage of completion that it will not be reproduced in this or future issues. Proposals on microwave equipment submitted by selected Canadian manufacturers have been received by the Department of Defence Production and Pinetree Project Office and are now being considered by the prime contractor (Bell Telephone Co. of Canada). Contracts for the production of microwave equipment are imminent but completion of the installations cannot be expected before late 1955. Shipments of material for tail cable construction have reached Port au Basque, Nfld. And Sydney, N. S. Supervisors are already on the job and property assessments are being negotiated. Staking of the re-building job at Harmon is underway. Completion of work is scheduled for Dec 53. As noted in previous reports limited operations are now being conducted at the following RCAF sites: Lac St. Denis, Mont Apica, Foymount, Edgar, Parent, Senneterre, and Falconbridge. Installation work is proceeding satisfactorily at Chatham. Delays are still being encountered in getting work started at Holberg, for which the installation contract is not yet approved. 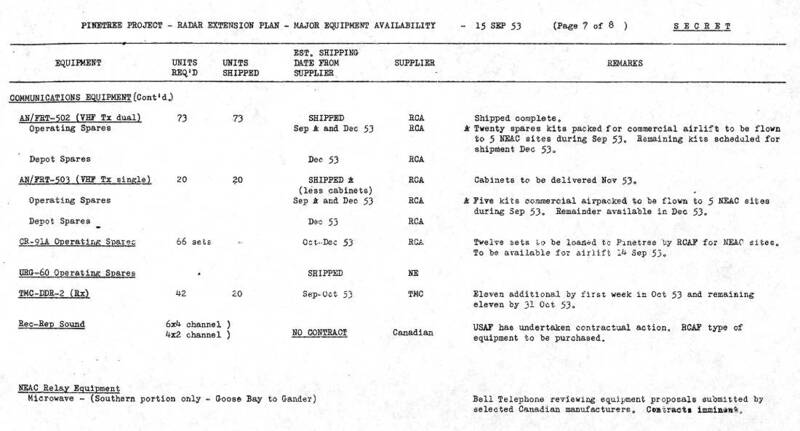 Activation of Comox and Tofino is dependent upon the delivery of the radar equipment, delivery of which is not expected before early 1954. Microwave circuits between St. Hubert, Lac St. Denis, Mont Apica, Foymount and Edgar are now complete. Some VHF circuits are in operation at all sites. HF circuits between Mont Apica, Lac St. Denis, Foymount and Edgar will be completed by 15 Oct 53. The limited operation date for Chatham has been changed to Sep 53 from Dec 53. Ramore - AN/FPS-3 main radar installation is completed (less radomes and pressurizing equipment) and is accepted and operating. Outside telephone plant is completed and accepted. Inside plant is completed and being tested. Antenna farms are 98% complete. 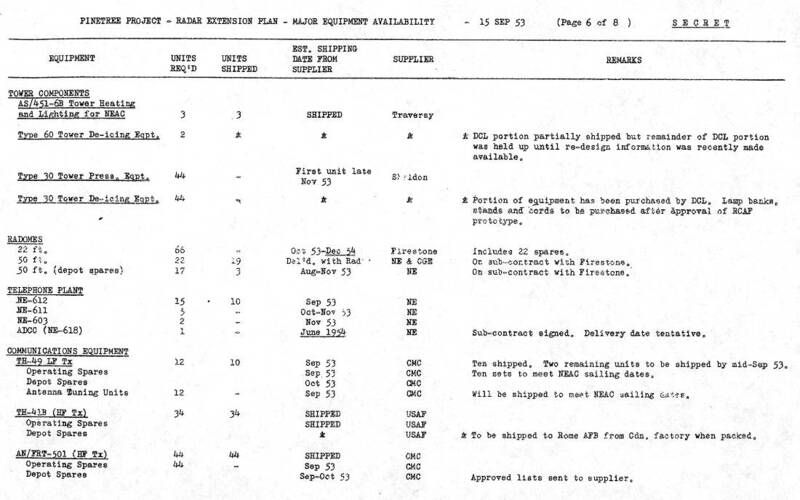 Pressurizing and IFF equipment to be completed during Oct 53. Pagwa - AN/FPS-3 main radar is completed, accepted and operating (less radomes and pressurizing equipment). Progress on other facilities essentially the same as for Ramore. Beausejour - AN/FPS-3 main radar is completed, including radomes and pressurizing equipment. IFF equipment is installed and tested. Completion of communications facilities is being held up pending construction of the outside plant which is scheduled for the immediate future. Puntzi Mountain - AN/FPS-3 main radar is completed (less radomes and pressurizing equipment) and ready for acceptance. Work on communications facilities is now in progress. Sydney - AN/FPS-3 radar installation is completed and undergoing flight tests. Installation has started at Clarke City (Moisie), Halifax and Ste. Marie. It is expected that limited operation dates will be met. The limited operation date for Halifax has been changed from 27 Feb 54 to Mar 54 and that of Clarke City (Moisie) from 1 Oct 53 to Nov 53. Installation work is also in full progress at Armstrong, Sioux Lookout, Baldy Hughes and Saskatoon Mountain. Installation work is under way at Goose Bay, Gander, St. Anthony, Cartwright, Hopedale, Saglek and Frobisher. 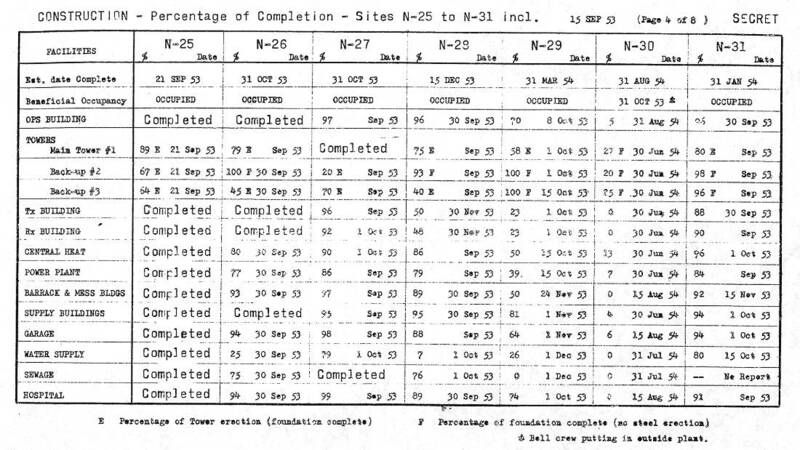 With the exception of Goose Bay (an AN/CPS-6B site) it is expected that the primary radar facilities (AN/FPS-3 sets) will be completed within the next sixty days. Adjunct communications facilities will also become available for acceptance at approximately the same time. Completion of AN/CPS-6B main radar facilities at St. John’s, Stephenville and Goose Bay will be delayed until early 1954 because of production difficulties. Page 3 of 8 is missing. Page 8 of 8 is missing.